I should state from the get-go that my family’s weeknight meal expectations are low. We have been eating a rotation of the same 5 or 6 meals for years. It’s down to a combination of lack of time and lack of imagination, but I think many of us are stuck in the same food rut aren’t we? So when Gousto asked if I would like to try one of their recipe boxes, the main appeal lay in eating something different for a change. I asked around and found lots of friends already use cooking boxes (who knew?) and generally had good things to say about them. So this week we’ve been fed by Gousto, and we’ll be going back for seconds. 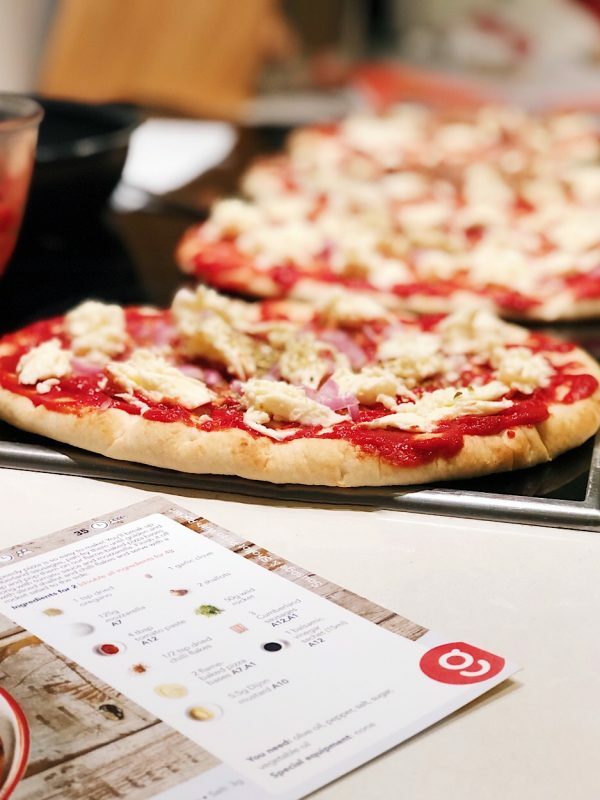 This is a sponsored post, use the code NOTABOUTTHEKIDS to claim 50% off your first two Gousto recipe boxes. One of the reasons that I have never tried a recipe box before is that I assumed it wouldn’t fit with the way we live. We never sit down together to eat the same meal 5 nights a week. Matt or I will be out at least one night. On Thursdays, it is activities-chaos which means I just feed the children fast, low-grade carbohydrates. So the first thing that I was pleasantly surprised to learn about Gousto is that each order can consist of just 2 or 3 meals. This I can work with. In order to give the box a fair go, I went for 4 meals in our first order. I chose from a range of 30 recipes that change each week. Everything you need to cook each dish is delivered in a box (with the exception of oils and seasoning), with strict instructions to the driver that it MUST be left in a safe place if you are not in. Each meal comes with a Helen-proof instruction card that walks you through the prep. We have the added complication of me being a fish-eating veggie and the rest of the household being enthusiastic carnivores. So I picked recipes that were either veggie or adaptable without generating waste. For the meat lovers, we had Pork Belly with BBQ sauce (I ate all of the sides, but swapped in something for the meat). Next, it was the Smoked Fish Gratin. I liked the look of Gujarati-Style Aubergine Curry so cooked it for a girls lunch. And on Friday night we made Sausage and Shallot Pizza (just leaving the sausage off mine). I have to say that this is very easy to write positively about. Every single meal went down well. The children have found dinner-in-a-box week especially entertaining, eating everything happily. Pork Belly and Pizza have been voted the favourites. Portion sizes are generous and the quality of the veg and meat is high (with decent use by dates). The amount of preparation involved varied dish-by-dish with the veggie curry requiring the most faff. It is possible to select only easy recipes if that is not for you. The pizza was super straightforward to make and my daughter (10) pretty much cooked that meal for us by herself. 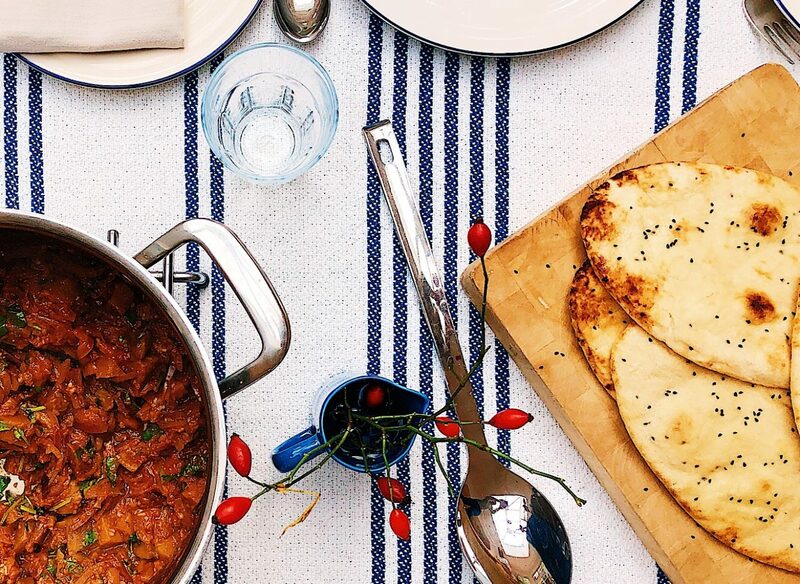 To make the most of Gousto you need to be up for planning your meals rather than making a daily supermarket run. I was conscious that there was a lot of plastic packaging in the box (although I understand that Gousto does better on this front than other recipe boxes on the market). Having said that, not all of the fruit and veg came separately wrapped. Also, as you are delivered exactly what you need for each meal, there is a reduced amount of food waste. For me, the best thing about it has been seeing the family interested in and excited about what they are having for dinner. Next week’s box has been ordered already. 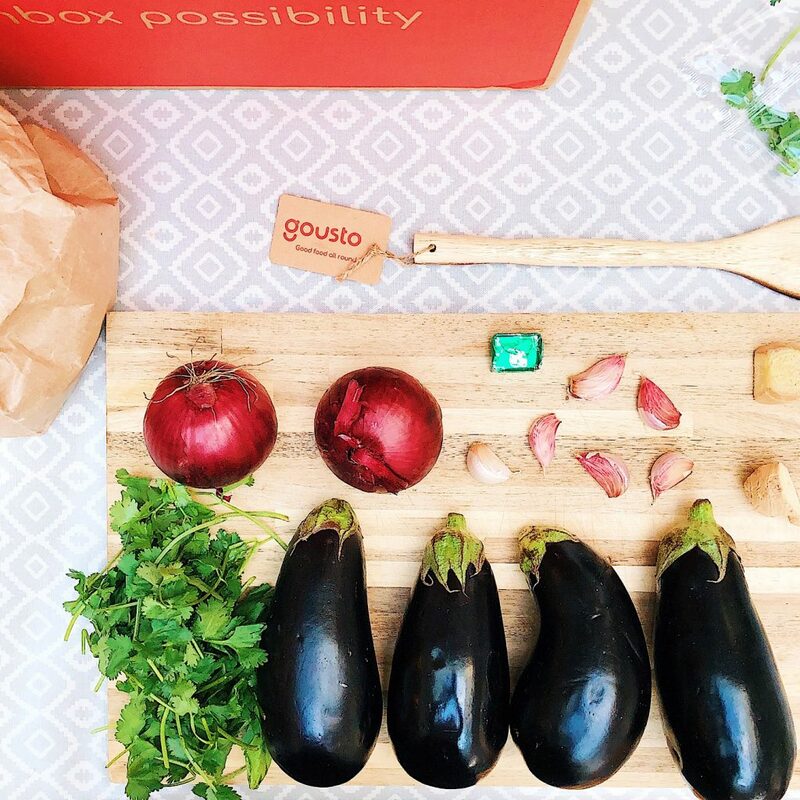 Use the discount code NOTABOUTTHEKIDS to get 50% off two Gousto recipe boxes. Click here to visit their website and check out this week’s recipes. I will receive a small payment for any order made using this code, but everything you read here is my honest opinion in my own words. My agreement with Gousto allowed me to create my own content without approval. I received the recipe box I cooked from free of charge. Hi H, you know I had a feeling that you might have tried this. I thought carefully about how to address the packaging issue in this post. Here’s what I concluded; while there was a lot of packaging in the box (particularly with the individual sauce and seasoning packets I thought) Gousto had made an effort not to wrap some items (aubergines, all onions and carrots). I also compared it to my Waitrose shop, where fruit and veg are sometimes DOUBLE wrapped in plastic. 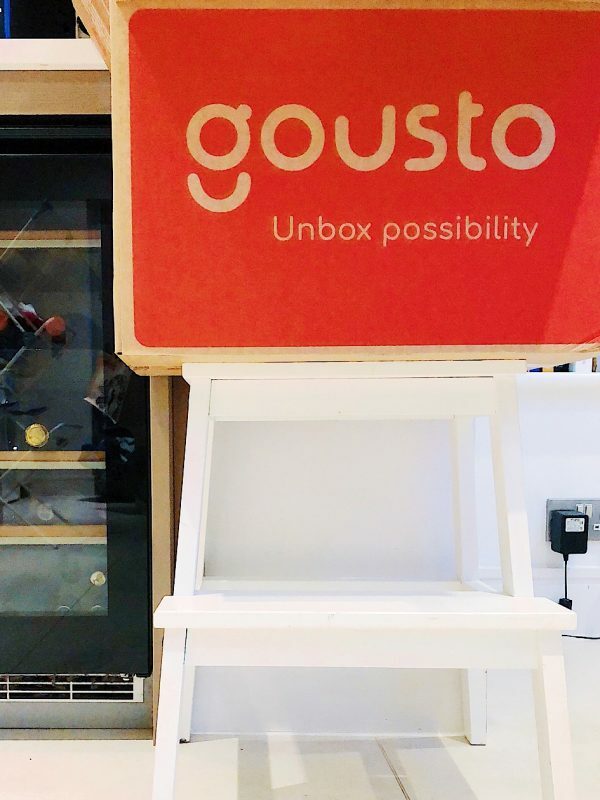 However, I’m sure that Gousto is man enough to take your feedback on board….